The Cheltenham Festival 2018, is upon us! 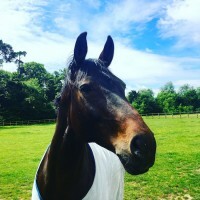 For a display of equine prowess and an exciting, yet friendly sporting gathering of passionate, racing afficionados, you just can’t beat Cheltenham! 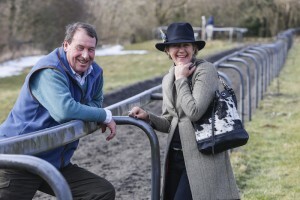 Last week Zulucow visited Kim Bailey’s race yard, in the beautiful Cotswolds; to watch work ahead of Cheltenham, and to stage a fashion shoot on the gallops! 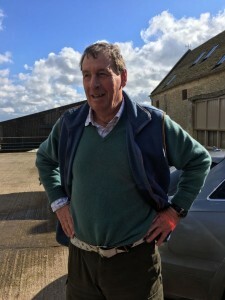 Kim Bailey is a great trainer (he famously trained ‘Master Oats’ to win the Cheltenham Gold Cup and ‘Alderbrook’ to win The Champion Hurdle at the 1995 Cheltenham Festival, (an incredible training feat which has yet to be emulated); and he trained Mr Frisk to win the 1990 Grand National in 1990. 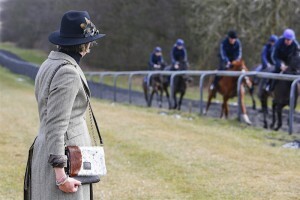 So what to wear at Cheltenham? 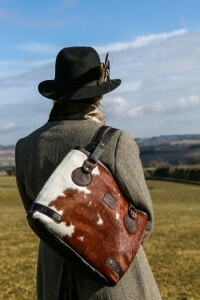 I advise layers, comfortable leather boots and a gorgeous, Zulucow cowhide handbag, to add drama to your outfit. 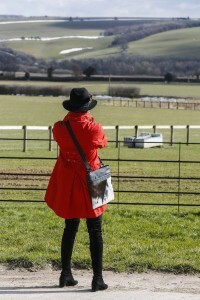 You can’t beat a ‘pillar box red’ trench and a black be-feathered fedora to ward off the rain; and a black and white Zulucow Cowhide Tote, to make a dramatic statement beside the paddock! 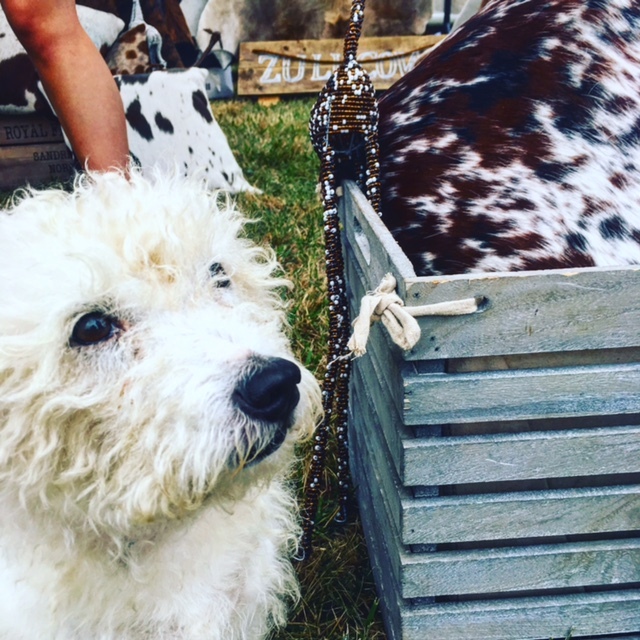 The Black and White Dalmatian Tote – eye-catching with red. 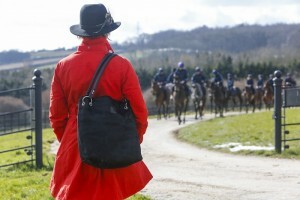 If you need a larger bag for your race card; ‘Racing Post Newspaper, hip flask etc..try our classic Black Zulucow Slouch Bag .With its polished take on slouchy hobo styles, this spacious bag is a perfect solution for ‘housing’ all that essential paraphernalia one needs for a day at the races. 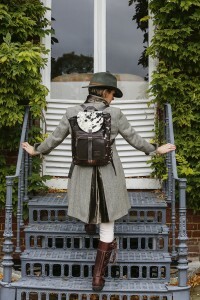 The ‘Mocha’ Cowhide Slouch looks great with tweed. But if you prefer a compact, capsule bag for your cash, cards, make-up and phone; the Zulucow Cowhide Clutch/Shoulder Bag is perfect. 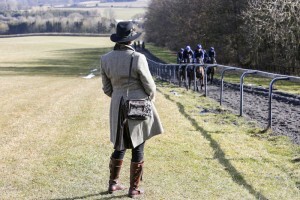 Staying at Cheltenham for the Entire Festival? 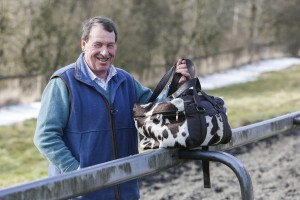 ‘The Zulucow Weekend Bag’ must be your ‘go to’! 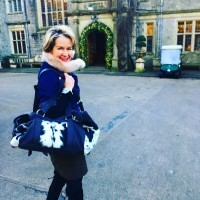 If you’re staying at Cheltenham for the full week, heads will turn when you arrive at your hotel with our signature, Zulucow Weekend Bag Even Kim Bailey, not usually a bag man (!) found himself drawn to our chocolate and white weekend bag! Even so, Kim relinquished the ZC Weekend Bag, and displayed his signature, sartorial flair by sporting his preferred Zulucow Cowhide Belt, and who can blame him? 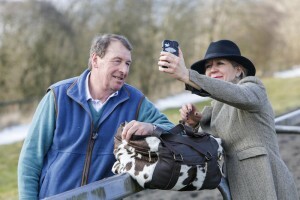 He does look rather rakish with it!